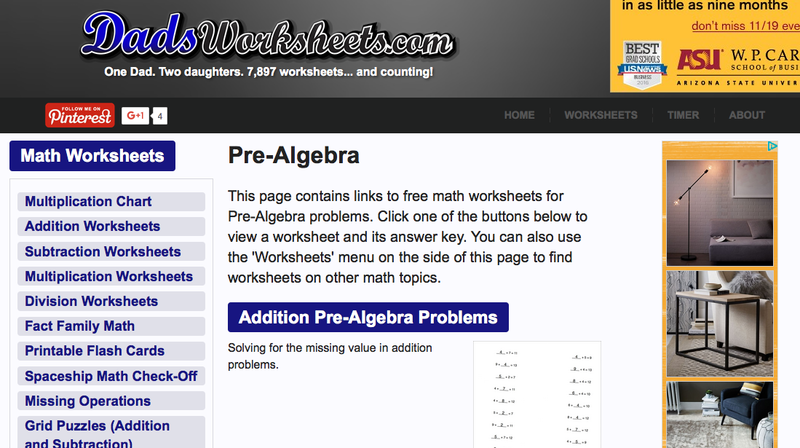 Because pre-algebra is so important, there are TONS of worksheets available. 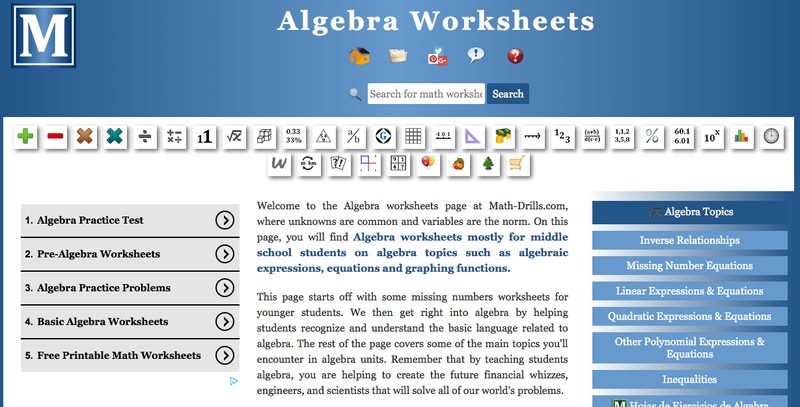 Here are 10 of the best worksheet websites available for pre-algebra practice, along with descriptions, so you can find the website that works best for you! 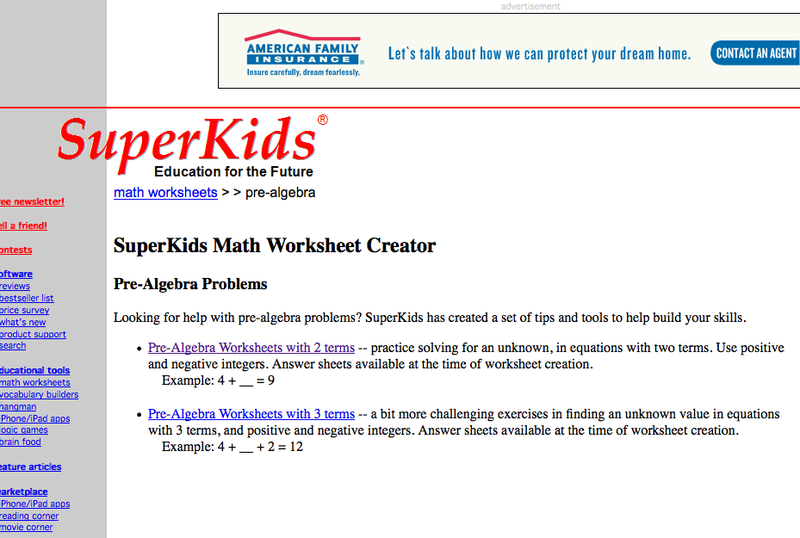 Math Worksheets 4 Kids offers pre-algebra worksheets with answers that delve into all the simple topics you could possible need to cover in pre-algebra; fractions, decimals, integers, measurement, exponents, squares, and more. There are also worksheets for math word problems and scientific notation! 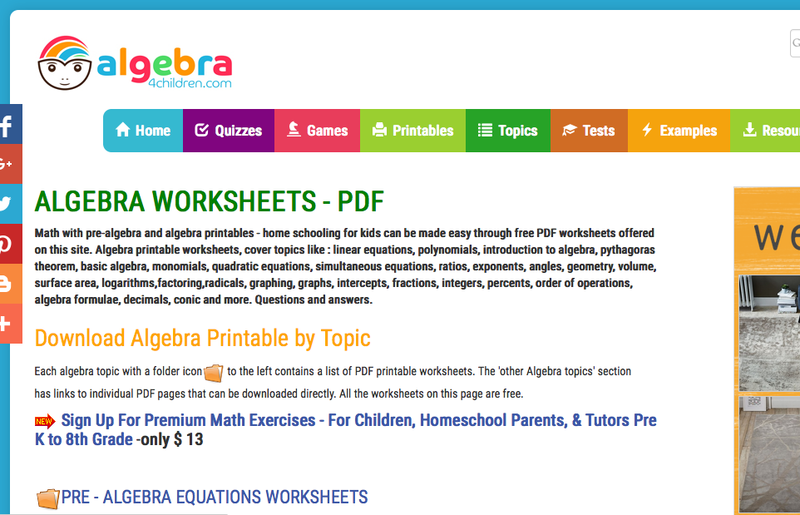 Each category has at least twenty different printable pre-algebra worksheets, and each worksheet and includes an easy-to-read answer key on the second page. Go forth and math! 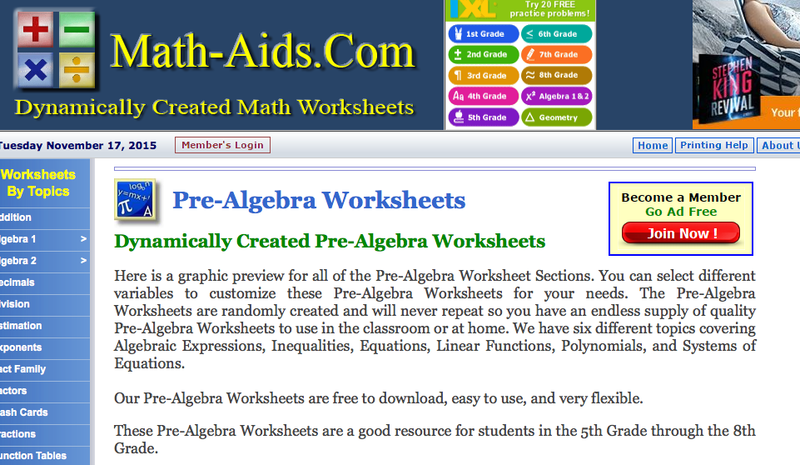 Math-Aids has six very specific pre-algebra worksheet sections: Algebraic Expressions, Equations, Inequalities, Linear Functions, Monomials and Polynomials, and Systems of Equations. Once you click on any of these sections, the website gives you more specific options. And then—here’s the kicker—you can go from there to create your very own printable pre-algebra worksheet! You can customize the types of problems you want on the sheet, the difficulty (easy, medium, or hard), the language, and even a memo/instruction line if you’re printing it out for your classroom. After you make your choices, you can hit the “Create It!” Button, and you then have the choice to print or save the worksheet. Plus, every customized worksheet comes with an answer key. Win! 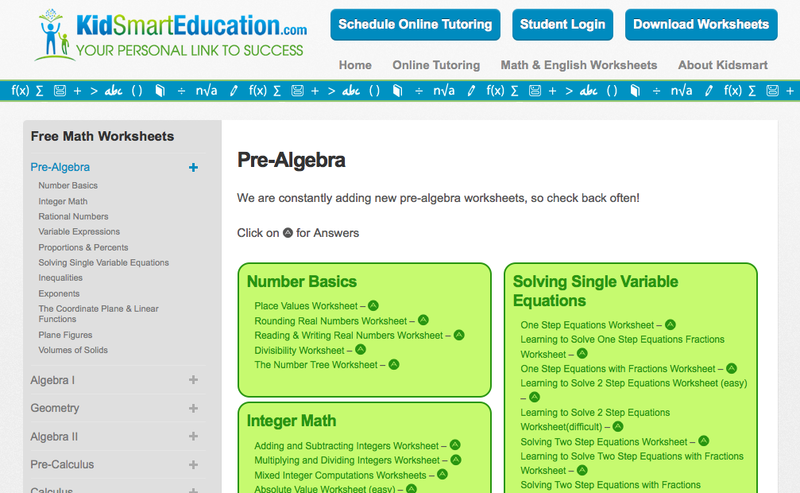 Kid Smart Education boasts pre-algebra worksheets with answers in 11 different categories. And even though these worksheets are not customizable, they are definitely comprehensive, and there are over 100 of them. Also worth noting: each worksheet is downloadable and printable, but the associated answer sheets must be printed separately. This website run by a dad who wanted to create helpful worksheets for his daughters would gain points on sweetness alone—but the quality of the worksheets doesn’t hurt, either. 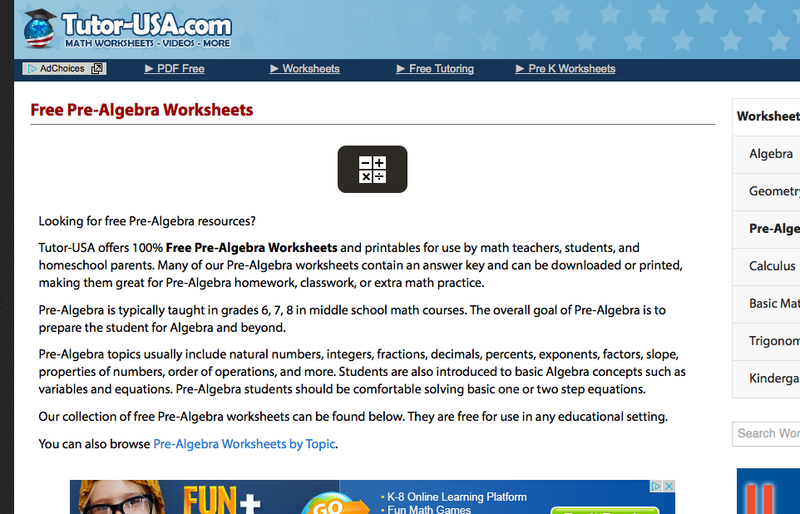 Their pre-algebra section offers worksheets in seven different categories, with roughly twelve worksheets in each category. Like Kid Smart Education, these worksheets are also non-customizable, and include answer keys that must be printed separately. Tutor-USA provides endless (endless!) pages of free pre-algebra worksheets, and they also mercifully sort them by topic…of which there are nearly 70. But wait—before you get overwhelmed, some of these “topics” only include one or two worksheets. When you click on a worksheet, make sure you scroll all the way to the bottom of the page to click “Download.” Don’t get tricked by the “Download” ad at the top! Tutor-USA also includes answer keys at the end of all of their printable pre-algebra worksheets. 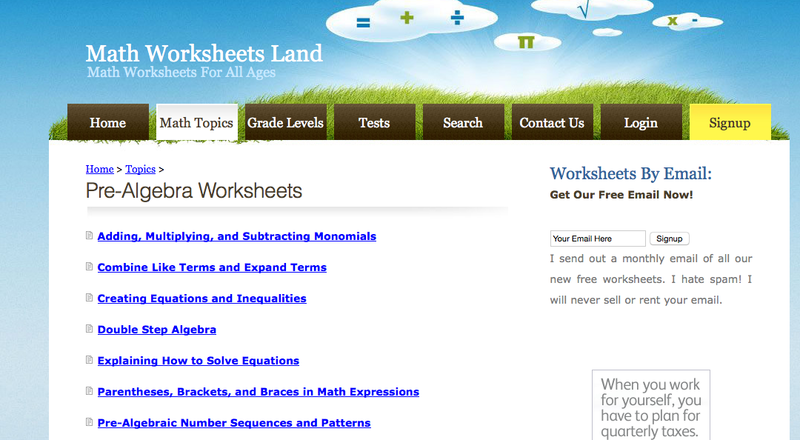 Algebra 4 Children offers worksheets that relate to many different algebraic topics. There are six official folders through which you can browse…or you can skip ahead to the “Other Algebra Topics” section, which features 9 more categories, and over thirty more worksheets. Each printable pre-algebra worksheet also includes an answer key, so you don’t need to print it out separately. Another nice feature of Algebra 4 Children is that they offer printable pre-algebra quizzes—so whether you’re a teacher, a parent, or a student looking for extra practice, here’s a place where you can test yourself! As far as organization goes, this site is one of the best by far. The worksheets are broken into topics, but then further broken into specific areas of practice; for example, “determining linear equations from slopes, y-intercepts, and points,” “using the distributive property,” “factoring quadratic expressions,” etc. This way, the teacher/parent/student on the website can find a printable pre-algebra worksheet with answers that perfectly matches their goals. Do you want your class to practice solving “ax-b=C” linear equations? Don’t waste your time sifting through tons of worksheets—just click the associated button! These worksheets include answer keys. However, when you click to download/print/save the free worksheets, a survey pops up. Don’t be fooled—just click “skip survey,” and you’re free to continue on to your beloved worksheet. Seventeen topics, and each allow you to create a worksheet that fits your exact needs. You can customize the value size (from numbers as small as 20 to as large as 2500), the type of operations, the type of signs (mixed, positive, negative), and then aesthetic choices like font, orientation, parentheses, text, and vertical space. Answer keys are included, and you can download and print or save your worksheet with ease. And in case you were wondering, even if you go back and make all the exact same choices when creating your worksheet, the numbers will all be different. Infinite practice? Infinite practice! Super Kids has the categorization thing figured out. Instead of billions of possibilities, they’ve narrowed it down to two: “Pre-Algebra Worksheets with 2 Terms,” and “Pre-Algebra Worksheets with 3 Terms.” Clicking either category will take you to a worksheet creator, where you can set your minimum and maximum value of terms used (between -100 and +100), and your number of problems on one page (between 4-27). Also, there is an option to print an answer key, though you do need to click a separate button once your printable pre-algebra worksheet is created. These simple worksheets are likely best for drills. 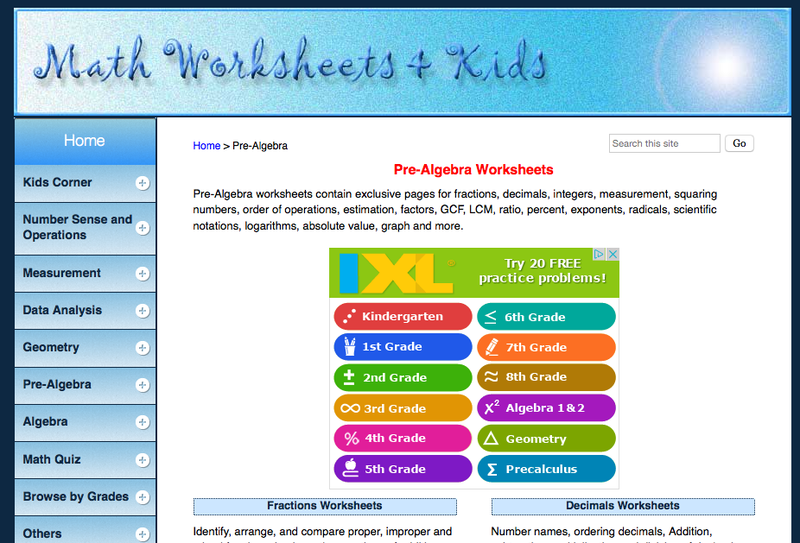 This pre-algebra section has 21 different categories to choose from, each with five or so associated files. These “files” include, alongside worksheets, lesson plans, and explanations of how each category conforms to a particular Common Core standard. The catch? To use these worksheets for free, you can’t get the answer keys. Though, if you want to sign up for a full membership, it’s between $2.50-$6.25/month. With all this pre-algebra practice, you’re going to be a master in no time! Whether you’re a teacher, parent, or student, these infinite pre-algebra worksheets will be sure to fit any need you have. Which of these websites are the most helpful for you? Let us know in the comments! Are each of these free resources? Yes they are! Hope you enjoy them.